Sunday reservation sunrise seen from Re-Member. When the pre-dawn light filters into the bunk room, I fumble my way into my clothes, through my stealthiest ever bathroom routine – only 20 feet and some thin curtains separate bathroom sinks from the bunks where the other volunteers still slumber – and out the door into a cacophony of bird song. My watch says 5:10 in the morning – a good four hours before I’d be out the door back in Massachusetts. But the spectacle of sunrise on the reservation renders the rituals of coffee and yoga unnecessary. Ted, the executive director of Re-Member, had told me last night that dawns here are joyfully noisy – and he turns out to be right. Along with the distinctive song of the western meadowlarks – those yellow-breasted musicians I will hear almost every hour of every day this week – a pack of coyotes howling and bark. 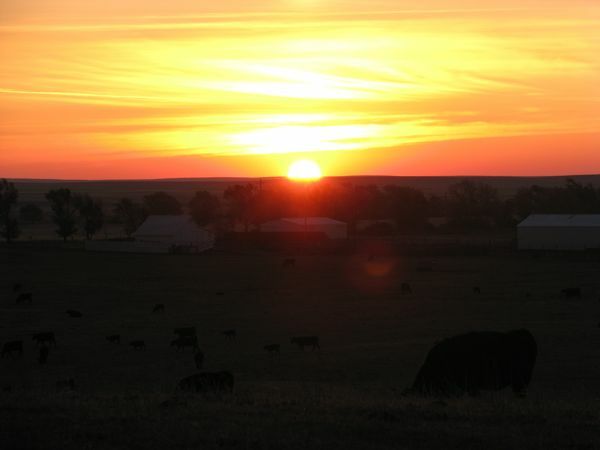 Below the higher notes of the coyotes and birds comes the bass of the mooing cattle – while they never acquire a rhythm, there are at least a hundred head in the rolling pasture. It’s over them that the sun emerges – a naked ball of fiery orange that then covers itself in some flimsy strips of cloud. I shuffle down the drive to the gravel road, along the fence separating me from the angus, thickly built even for cows. When I look the other way, a couple of Appaloosa horses come intently galloping over, along with a gray mare and another couple of friends. While they study me as a potential bearer of oats, one starts to slide behind the mare – only to get a quick pop from her rear right hoof. Cows look down as I walk the gravel road. It beats the hell out of the yard waste facility, which is my morning view back home – at least, until the spring foliage crowds it out. Don’t get me wrong: I love the dense woods that crowd my third story balcony, the limbs that have crept to within ten feet of the rail, the festival of songbirds that flit to and from my feeder every day back in New England. But I can’t help but marvel at how Pine Ridge Reservation is so wide open, both visually and sonically – lack of human structures and noise seems to amplify the revels of nature. I chance a path that cuts diagonally from the gravel road to the bench near the hilltop, despite the dampness of the prairie grass and – as someone will point out later – the chance of encountering a rattlesnake. A Northern harrier hawk – my first ever sighting of one – pops out of the grass ahead, swooping low and elegantly as it scans for prey. A couple of hours later, when Ted enters the common area to address the masses, I want to share my nature-inspired joy, but his earnest demeanor as he settles behind the podium holds me back. He is about the deliver the Wisdom of the Elders. Within five minutes, his talk shifts my mood from big country bliss to anger and sorrow at what has transpired here. This morning’s Wisdom of the Elders goes back in time to the 1800s, reciting the sad history of Wounded Knee Creek, where cavalry had rounded up Lakota men, women, and children – and slaughtered them. Sioux such as Big Foot – on his way to confer with Sitting Bull about escalating tensions – were intercepted by cavalry and led to Wounded Knee. Ted, right, and friend look out from hilltop cemetery. In Ted’s story, on the morning of December 29th, 1890, instead of food, the Lakota were given last rites; soon afterward, the shooting began, going on for two hours. (I will read different versions of how the shooting started.) Then, as Ted describes it, cavalry were sent on horseback for five miles in every direction, rounding up the women and children sent fleeing through the tree line; the women were raped and killed, the children shot in the head. 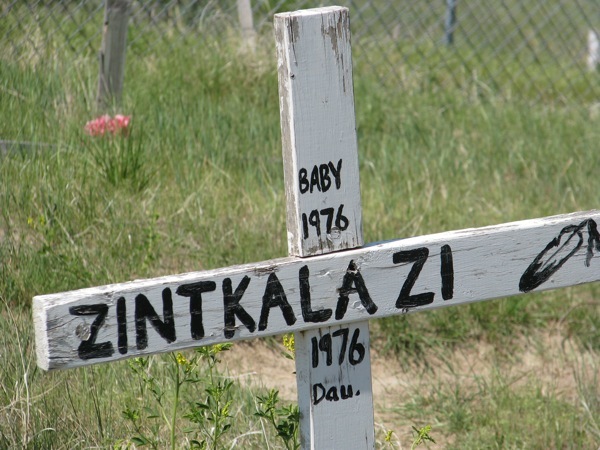 A blizzard delayed burial for days; finally the frozen bodies were tossed into a mass grave; one estimate I read places the death toll at 146 Lakota and about 25 soldiers. Cavalry might have seen this as vengeance for the defeat at Little Big Horn – itself spurred by a white attack –the incident also came out of white attempts to prevent the Lakota from practicing ghost-dancing, a religious ritual that while restoring pride in their culture, posed a threat to the status quo white authorities wished to reinforce. So it was that a nation founded on the principle of religious freedom was willing to kill others who practiced it. Some would say it’s more complicated than that, but as Native American history indicates time and again, the most absolute principles suddenly become relativistic when they get in the way of greed. Worse, the injustice remains after the gold is gone. The Lakota wouldn’t regain the right to practice their rituals remained in place until the late 1970s. I have come into Wisdom of the Elders knowing much of this, and how I feel about it, which is, of course, both angry and sympathetic. Yet being here deepens the feelings – and will keep deepening them for days to come. The earnest request to “unplug” from cell phones and computers intensifies that experience – taking away the distractions we use to distance ourselves from unpleasant realities. Instead, as the bus takes us north to Wounded Knee, people either talk with each other or just stare at the countryside. Finally, we slide over onto a widened road shoulder and disembark. We share the shoulder with the Lakota, with their dogs and their children, wares spread on the hoods of their cars and trucks. We wave as we walk across the highway and up the curved path to the cross-bedecked arch – the entrance to the mass grave at Wounded Knee. At the gate, a local whose name I never catch gives a talk about the fateful day – “they called it a battle, but it was a massacre” – before letting us into the cemetery. In the middle, a long rectangular fence marks the mass grave itself, but as others circle inside, I stay outside, lingering at tombstones erected for Lakota who have passed in the years since Wounded Knee. I find the 1919 marker for Lost Bird – a girl who, as an infant, was found crying amid the bodies piled in the mass grave. She was rescued by a white soldier and raised in that world, only to commit suicide at the age of 29. Normally I would revel more in the love of language, as well as a slight case of name-envy: There is something provocative about being named Spotted Bear, Respects Nothing, Little Moon, Her Many Horses – or Thunder Horse. 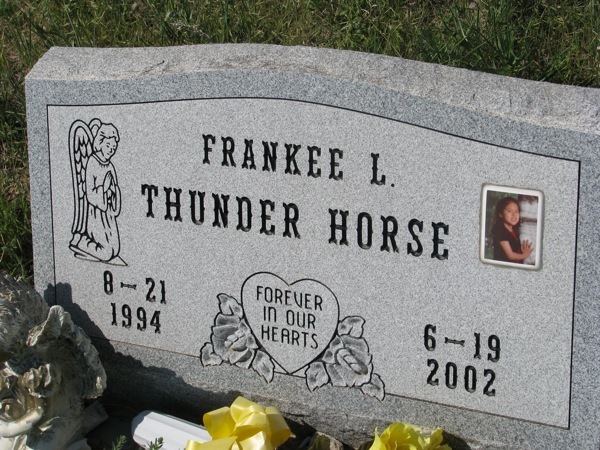 But Frankee Thunder Horse died before the age of eight; a picture is included in the polished, elegant tombstone. Meanwhile, Zitkala Zi, who died as an infant, was only afforded a crude white cross. I don’t know the story of either child, but their presence calls to mind those lowered life expectancies, especially the heightened rates of infant mortality and suicide by the young on the rez, numbers fed by the high rates of sexual abuse and alcoholism, the crowded living conditions which make protecting children harder. Not to mention the simple lack of hope, of a vision of better future. Which is one reason that when we descend the hill, we spend way too much on dream catchers and medicine bags. (After what we’ve heard and seen, can white Americans really pay too much?) 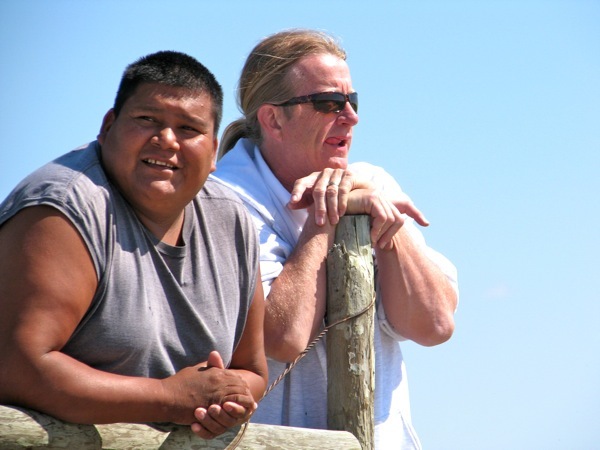 Our drivers let us mingle with the locals; we talk about how they craft their souvenirs, we banter with their children, we pet their dogs, wandering free as any good rez dog does. When I line up students for a photo in front of the Wounded Knee Massacre plaque, I suggest they not smile – but a few can’t help it. From Wounded Knee we go to Porcupine, where we eat sandwiches in the back yard of a teacher’s apartment; she actually lives in Wisconsin, but has spent a year here teaching primary school. 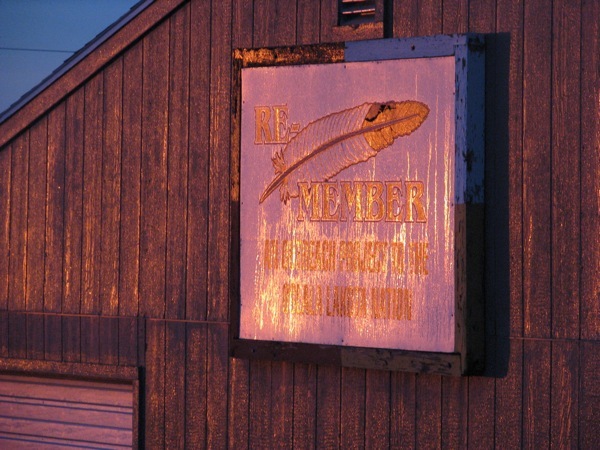 Her apartment includes a bird’s-eye view photo of students and staff standing in the Porcupine School Parking Lot, in the shape of an eagle. “It’s a different animal each year,” she tells me. 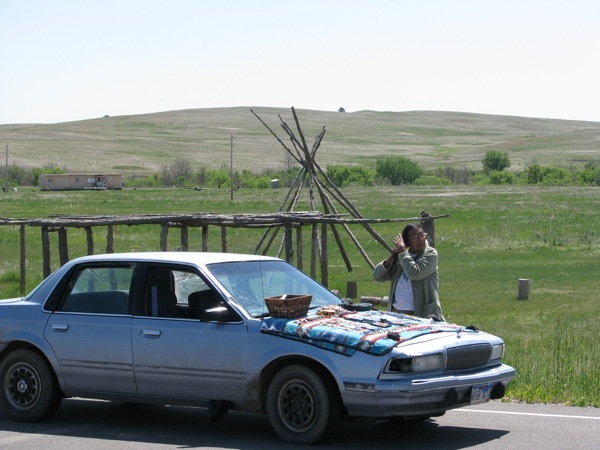 Lakota man sells his wares across from Wounded Knee. We agree that a porcupine would be a particularly difficult animal to shape into clearly recognizable form. I suspect the same will prove true of summing up our experience this week. On one hand, Bill, a particularly funny and amiable member of the Re-Member staff, is earnest long enough to point out that the hand sanitizer we were using was actually drunk here for its alcohol content – possibly a symptom of the intersection of rampant alcoholism and poverty, as well as Pine Ridge, larger than Connecticut, prohibiting alcohol. 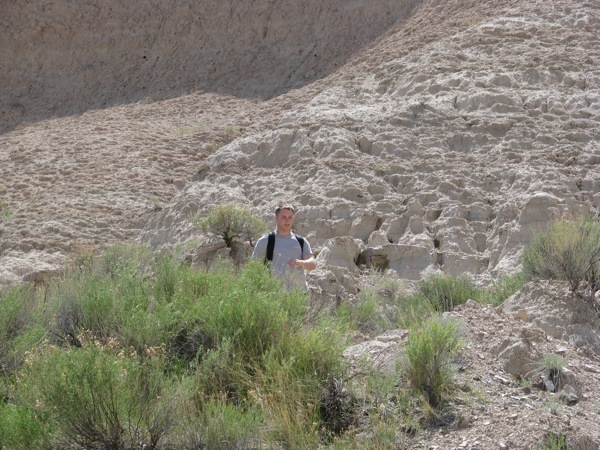 Soon we’re gone ourselves – to the Badlands. We turn off at the park visiting center, but don’t stop, just drive by butte after butte, crater after crater, until the bus lets us out into the heat of the day. We hike across a valley and scamper up a hill of cracked dry earth, from which a tableau of volcanic ash and diatomaceous earth sprawl away under a cloudless sky. Justin seeks his meditative spot. I climb part way up a hill to my left, lie down amid dry earth and grass, prop one foot on a knob of earth that protrudes like a saddle horn. I meditate every day, even if I skipped this day, so I feel that I know how to do this. How to let go. How to be in the here and now. But not this here. Not this now. Sure, I take the prescribed long breaths, try shutting my eyes, listening for wind or scrapes or rustles. Over my eyes I slide down the bill of my cap – the one featuring the white whale who, in Melville’s novel, sunk the Pequod, a ship named after yet another doomed tribe. I reflect on the contrast of the reservation so far – the joyous splendor of dawn, the sobering history of the morning, the joy of the people we’ve met by the road shoulder who, like the hardy grasses that break up these barren badlands, keep on keeping on. But no matter how long I lie, what I cannot do, at least for more than a few seconds, is keep my eyes closed. 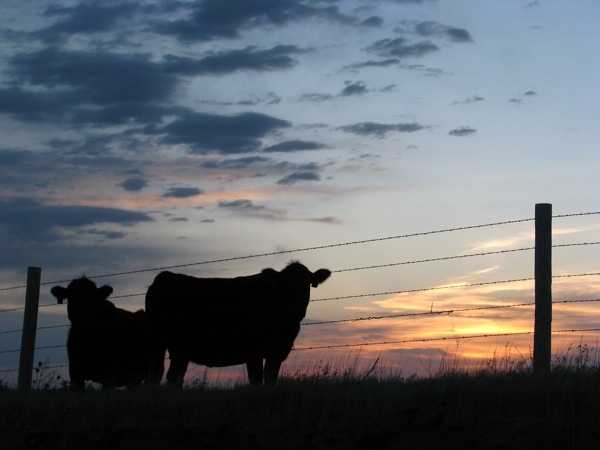 I would like to paint the picture of the sunset with cows by fence, would you be willing to share photograph, it will be a gift for a friend of mine who loves cows!